Collagen 360˚ Intensive Cream is an intensive action cream developed from enriched marine collagen, in order to counteract the loss of collagen in the body. Activates the regeneration of collagen. Maximum reduction of wrinkles. 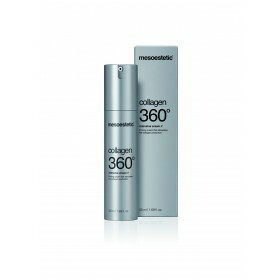 A bottle of Collagen 360˚ Intensive Cream for home maintenance leads to results obtained in the beauty salon. Collagen 360˚ Intensive Cream is an intensive action cream, developed based on enriched marine collagen, with the aim of compensating the loss of collagen in the body. What does enriched marine collagen offer? Many cosmetics include collagen in their formula because they help the skin to keep its firmness and elasticity. But Collagen 360˚ Intensive Cream is different to other products – it includes a high concentration of this active principle. The enriched marine collagen improves skin elasticity and softness. It is 100% marine and completely compatible with all the skin cells and all types of skins assimilate it. Because of its low molecular weight and the formula of its base, it penetrates until the second layer of the epidermis in order to act where the skin needs it. Collagen 360˚ Intensive Cream synergy reduces wrinkles, gives the face back its volume and makes skin healthy.